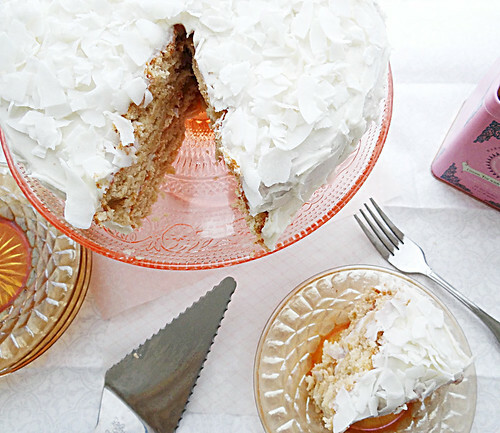 put on a pretty dress & eat this pretty cake today! 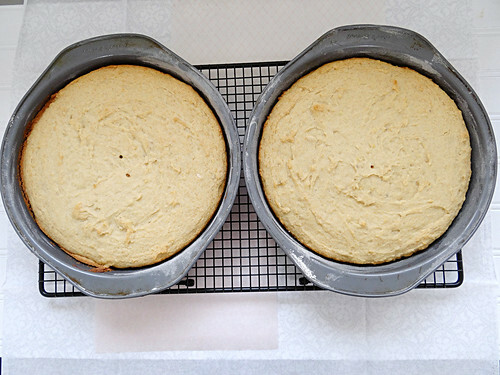 Lightly coat 2 (9-inch) round cake pans with butter; line bottom of pans with wax paper. 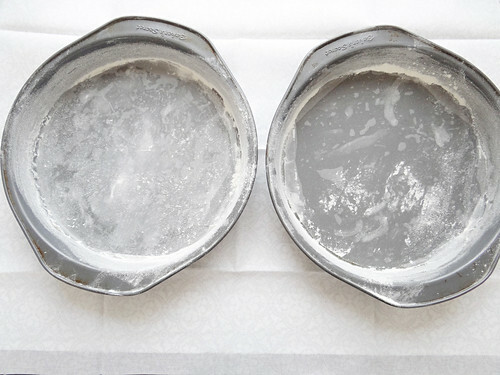 Lightly coat wax paper with butter; dust pans with 1 tablespoon flour. 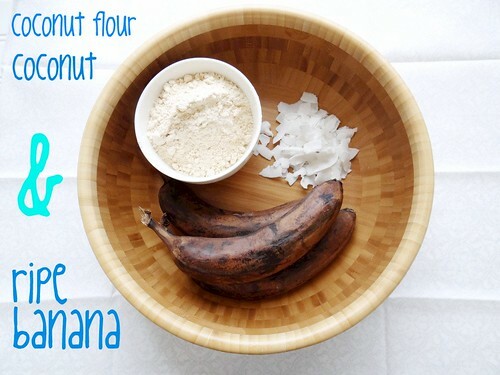 combine flour, baking powder, and salt; stir with a whisk. Place 1 1/2 cups sugar and butter in a large bowl; beat with a mixer at medium speed for 2 1/2 minutes or until well blended. beat in banana. 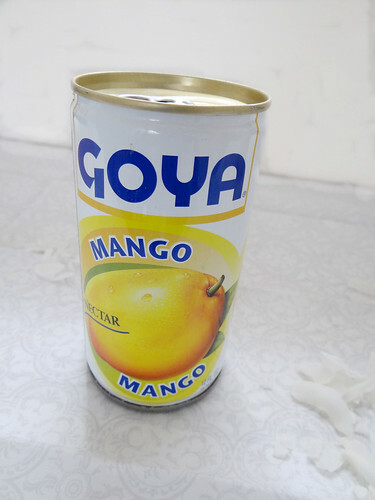 add flour mixture and mango nectar alternately to sugar mixture, beginning and ending with flour mixture. Beat in 1 teaspoon vanilla. pour batter into prepared pans. 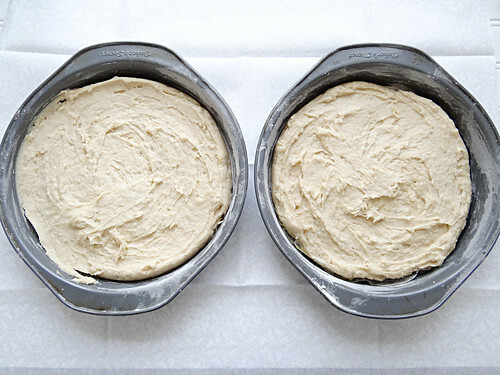 Bake at 350° for 22-28 minutes or until a wooden pick inserted in center comes out clean. Cool in pans 10 minutes on wire racks; remove from pans. 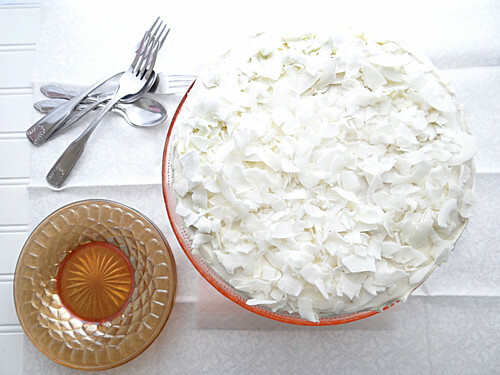 Discard wax paper. Cool completely on wire racks. 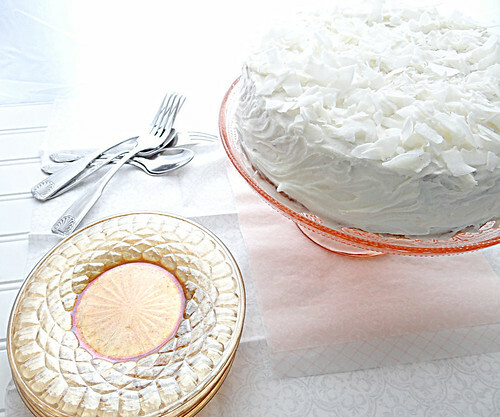 To prepare frosting, add all ingredients in a large bowl; beat with a mixer at high speed. 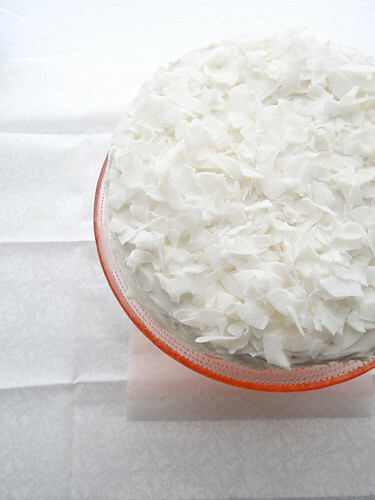 place 1 cake layer on a serving plate, sprinkle with 2 tbsp coconut flakes and spread a thin layer of frosting over the top. Top with another cake layer. spread remaining frosting over top and sides of cake. 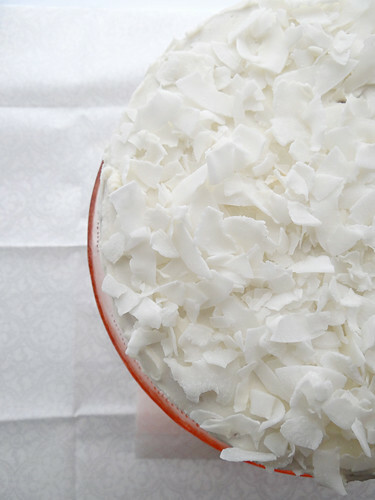 top with 1 cup of coconut flakes. The Captain Morgan Lime Bite is so so good; excellent choice for the frosting! 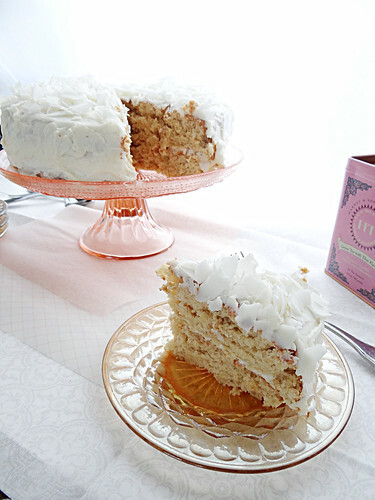 I could go for a big thick slice of this cake right about now, since I'm going through withdrawal after swearing off of baked goods for a while (darn you, pants that don't fit after hogging out during the holidays!). Wait, how in the world did I miss this post??! And this cake is just gorgeous! 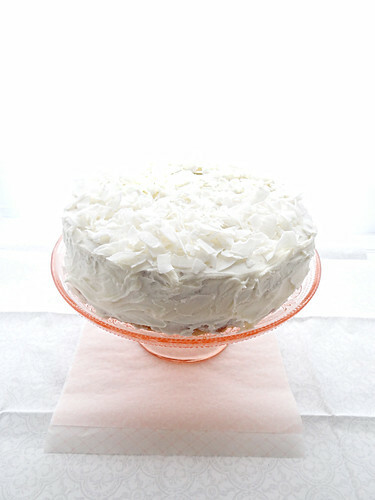 My stepdad used to make this amazing coconut cake that I would spend hours eating and yours reminds me of it. I haven't had it in years and now it looks like I can eat it again :) AND I can totally convert this to be gluten free too. Eeeeeee! 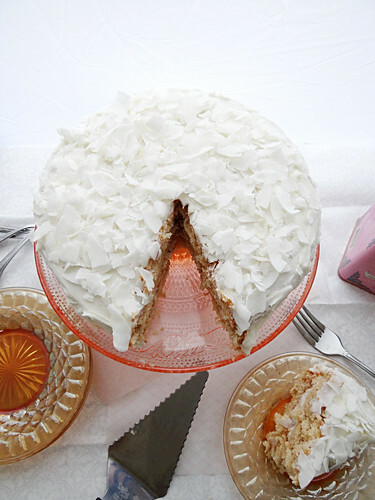 Genevieve - I am so Glad you like the recipe, this cake is truly amazing! This sounds terrific -- and I'm not even a vegan! I love the combination of flavors you've used! @ Felicia - thanks for stopping by and for the lovely comment! @ Cara - as always you know how to make me smile - I can't wait for your Valentines Day Bake Off Challenge! I feel like I am preparing for the Iron Chef!! OMG... This cake looks fantastic! Omg.. gorgeous gorgeous and i am super loving the flavors! the mango nectar, coconut, lime and rum! happy blogoversary! i love your pictures and everything about your blog! Best of luck with your recipe submission for Fork & Beans Valentines Day Bakeoff!!! 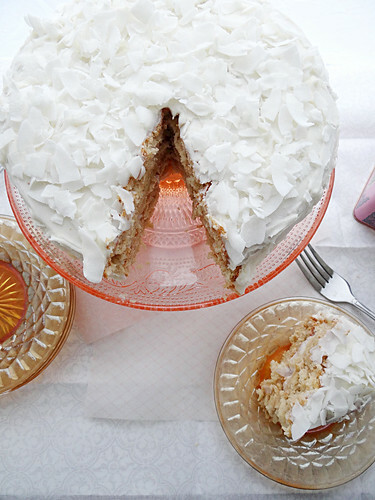 This cake is beautiful and would definitely make anyone who ate it happy - mango nectar, lime, coconut and bananas? Thank you for stopping by for a visit - this had to be one of my favorite cakes that I have made yet! Ce gâteau est parfait ! It has the perfect creamy look...wow! I will totally keep this recipe for a special occasion. It looks so good.